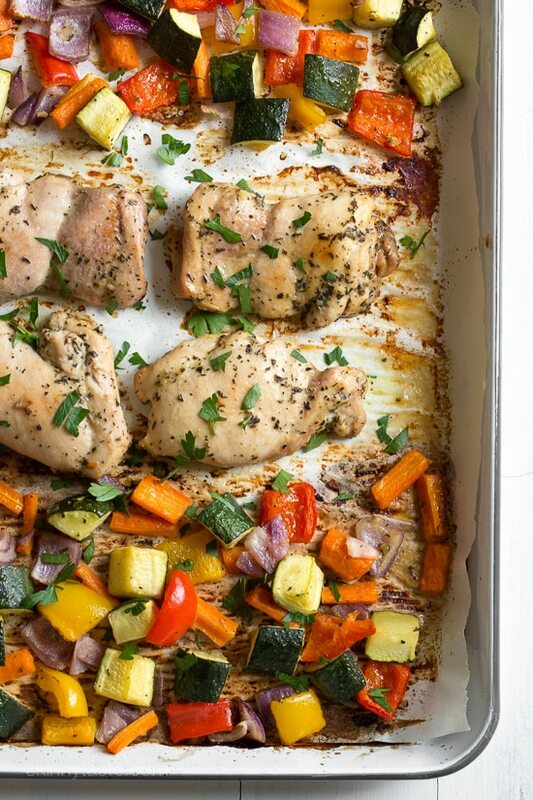 Assemble this super easy chicken and vegetable dinner on a sheet pan (or two) and pop it into your oven for a delicious, fuss-free meal. For easy clean-up, line your sheet pan with foil or parchment. 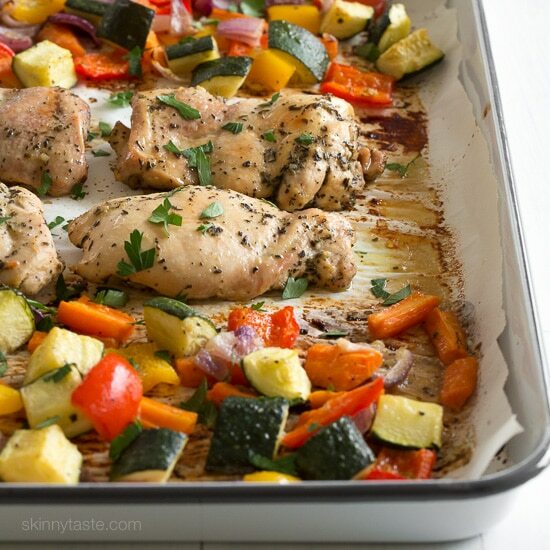 This meal, made with colorful vegetables and boneless skinless chicken thighs (which are much juicier than breasts) are tossed with a simple Italian dressing marinade that can be marinaded ahead and roasted just before dinner. If you want to add grains to your meal, quinoa or brown rice would be a great addition. Preheat oven to 450F degrees. Spray 2 large nonstick sheetpans with oil or use parchment or foil for easy cleanup. Arrange the center rack and lower third. Combine the Italian seasoning ingredients in a large bowl. Season chicken with 1/2 teaspoon salt, then add the chicken, zucchini, carrots, bell peppers and red onion to the bowl and toss well to coat. Marinate 30 minutes or as long as overnight. Arrange everything onto the prepared baking sheets spread out into a single layer. The vegetables and chicken should not touch. Bake about 20 minutes, turn chicken and vegetables and bake an additional 10 minutes, until roasted and tender. Top with fresh parsley and serve. First time making a sheet pan dinner. This was really great. Substituted veggies: used cauliflower, Brussels, asparagus, red and yellow peppers. Chose bone in thighs so took a bit longer. Will definitely make again and already shared the recipe with friends. I believe that the red wine vinegar really MAKES this dish! We love the sheetpan recipes. Had this on a few times. Also love the shrimp one. It’s easy! Tastes better than you think it would because of the herbs. Realized I got chicken drumsticks! Will this still work!? This was my first time trying the weekly meal planner and I gotta say it was phenomenal. This recipe was probably our favorite of the week… 5 stars for being easily to prep/make/clean up After and 5 stars for flavor. The chicken was juicy and the veggies were flavorful and tender. We used zucchini and squash from the garden. I’ll defintely be adding this into our regular meal rotation! My hubby loves roasted veggies of any sort. We added sliced fresh mushrooms and cherry tomatos, didn’t have time to marinate, but he proclaimed these the best roasted vegetables he has ever had! He kept saying, “this one’s a keeper.” And it’s so easy. Thank you. Just tried this last night, it was easy to make and delicious. I added some white rice to mix with the veggies. My second time making this and it’s some of the best chicken I’ve ever had. It’s so easy and cooks perfectly!!!! Thanks for such easy, amazing recipes. Another delicious recipe! I followed the recipe besides I used bone-in skin-on thighs. After marinating them, I padded the skin dry and sprinkled some extra salt, pepper and herb mix (without the oil) on it and baked it for the same amount of time. It came out juicy with a crispy skin! This has been on regular rotation at my house for well over a year. My super picky 5 and 8 year olds love the chicken (they still don’t do roasted veggies so I give them cut raw veggies on the side). I’m a WW life timer and even though you could switch to chicken breast for zero points – I find the thighs delicious and worth the extra points. Thank you for such a great recipe! I did not see the part in the directions about separating the chicken and marinade from the veggies and they’ve been in a bag together all day. Is it still safe? This was absolutely delicious, going to try it with breasts next. Thanks! Thanks for a great recipe. Delicious and easy, who could ask for more? I used boneless breasts and still juicy! Will make this again. Delish! And so easy…. definitely need to marinate, I was short on time and didn’t, and it didn’t get to its full flavor potential…but still yummy nonetheless! Even the 8 year old loved it, practically licked his plate clean, I thought maybe he would have at least picked the onion out, but he ate every bit. I left it in a little longer because we like nice caramelized veggies, they were so sweet! Husband “doesn’t like boneless chicken” so next time i’ll maybe make half bone-in, i’ll just have to start the bone-in before the others. Another 5 star Gina, thank you! What would the Freestyle point total be if skinless chicken breasts are substituted for chicken thighs? My chicken was a little dry, the carrots were undercooked, and the zucchini was pretty mushy. I think I will omit the carrots next time and decrease the cook time a bit. Not quite a hit the first time, but I’m going to try again! 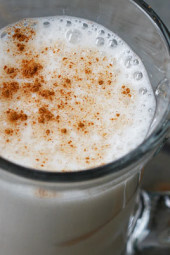 I make this recipe all the time and LOVE it! I change up the veggies from time to time. It’s so flavorful! Oh man! This is so good! I make this all the time. My family LOVES it! They don’t think of it as healthy eating at all. I’ve made it with chicken breast as well. Thanks so much for this recipe!! Have these recipes been updated to Freestyle…….thought chicken was free! All Smart Points have been updated to Free Style points. Super easy. Soo good. One pan clean up! I make extra chicken just to use in other recipes. What would be the freestyle points of this recipe? Hi…I just love your site and recipes! I have shared your site with friends and they love you too! I have one concern about this recipe. At first, the instructions direct to mix the chicken with the vegetables and seasonings, but when on the pan it states the the veggies and chicken shouldn’t touch. Please clarify. Thanks. Thanks Gina! You’ve made this Mom feel like a champ! Hubs was out of town, I got home from work later, my son had a baseball game and I needed to get dinner on the table fast. This was a home run (pun intended). It was easy and very good!! Thank you!! I never leave comments, but I just had to say this was amazing! So tasty and healthy. My one-year old liked it too! This will be regular in our rotation because it’s so easy and healthy. This is SO good!! A huge hit with my Italian papa!! I am really excited to try this meal tonight! I was planning ahead though and put this into the WW iPhone app and came up with 10 smart points based on the nutritional information provided. I am going to try this either way though! My son is a truck driver, I wanted to make this dish and other receipes of yours for me and my husband and then be able to put the left overs in freezer bags with my food saver and freeze them for my son to take on the road. Would it be alright for him to put the frozen food in a cooler and use within 5 days cooking them in a microwave. I would like to be able to cook healthy meals for him to take on the road. I think they would be OK, it will partially depend on how long they stay frozen before they thaw. Maybe just try a few at a time to start. Made this tonight and it was delicious! This will be a regular in our house! Thanks! Completely safe, they both get cooked. You’re not eating the vegetables raw. Thanks Gina for your reply, I made this early in the am and loved being able to just put it on the sheet and into the oven without any prep at the dinner out. It was delicious and will be adding to our rotation. I have some really picky eaters and making dinner had been something that I would dread from the second I woke up, until I found your site and cookbooks! Now I don’t even stress about it! This is a favorite dish in our house. We’ve been having it at least once a week since November. I love the versatility – we use whatever vegetables we have on hand and it comes out great! Thank you, Gina, for your time and commitment to providing nutritious recipes. I feel like a much better mother and wife because of your recipes! Thank you Anni, what a nice thing to say! Question- can I use an Italian seasoning packet instead? Any other shortcut advice? Thanks! Just made this for dinner. The chicken thighs were so flavorful (and I was never a chicken thigh fan-this recipe changes that). Whole family loved it! If it’s already been asked, I apologize. How will using chicken breast change the nutritional value? I don’t do WW, I count calories, and balance carb, fat, and protein ratios. This was delicious. My husband was skeptical because it was healthy, but he asked for seconds. It was so easy to make too. I used chicken breasts it came out great. This was delicious! Prepped everything yesterday and had it marinate overnight. It was SO easy and turned out great! Kid, baby and husband approved. This may be a weekly meal for us. So delicious. The whole family really enjoyed this, especially the vegetables. I wasn’t sure about the thighs as we usually stick to breasts but they were perfect. Looking forward to making this. Would substituting eggplant for the carrots effect cooking time? I think it would be the same, I’m guessing. Made this tonight with chicken breast. Also used balsamic since I didn’t have red wine and added broccoli and mushrooms! Yummy!!!!! This was great. I prepped this on Sunday afternoon and popped it into the oven when I got home from work. I made some pasta for the kids and dinner was done very fast with very little cleanup! 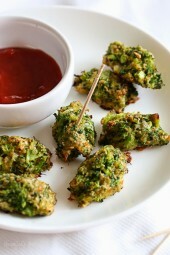 This is a great prep ahead meal for weeknights! quick question I see sugar is in the recipe so how is it whole 30 approved? I was wondering the same things. I’m probably just going to leave out the sugar. I don’t normally cook with sugar. If I leave it out, how will this change the flavor? Is the chicken sweet? Will it reduce caramelization? Can I substitute anything for it? And finally, will it affect the smart points if I just leave it out? whew! You can leave it out. Congrats that’s awesome! This is the first recipe I made from this site and it was so easy and so tasty! I loved all the yummy vegetables. Just the thing to cook on a icy Winter day. I look forward to trying more of your recipes. Quick question-I did the points using the Weight Watchers calculator off of the nutrition information you provided per serving and it shows that it is 10 points per serving but you are showing 8 Smart Points. I’m not sure if I’m missing something? I was wondering about this as well! Thanks for taking the time to explain it. Fantastic recipe, my boyfriend and I both loved it! Cannot wait to make this recipe tonight! However, I do not have boneless chicken. Any suggestions on how to adjust the cook time for bone-in chicken? Iwe loved this. So easy to put together. Looks great!! Can I use boneless chicken breasts? If so, how much longer should I cook this? So I made this recipe. Just a warning though: the recipe calls for a 450 degree oven and parchment paper is not supposed to be used at that high of a temperature. I almost burned the house down! So sorry, I had no issues whatsoever with the short cook time, but good to know. I made this tonight and thought it was really bland. I followed the recipe to a T. Probably will make again, but will have to figure out how to add more flavor. Absolutely delish! The chicken was super moist and tasty along with the veggies. Thank you! I made this for a second time the other night. I didn’t have any chicken thighs so I marinated the vegetables, put them on one side of a large sheet pan and put Italian chicken sausage on the other then followed the cooking instructions. It was really good with the sausage. Oh. My. God. We made this last night… AMAZING!!! We actually doubled up on the seasoning and threw a pinch more of some of the herbs in. We didn’t have any red wine on hand so we used Marsala cooking wine. Came out amazing. We didn’t have much time to marinade our chicken breast yet it still came out juicy and full of flavor. We were really impressed with this one pan dish. Highly recommend. P.S. If you have any leftover vegetables they also taste amazing the next morning in an omelet as we just found out this AM. This is great. You can really use whatever vegetables you want. I threw on carrots, asparagus, and mushrooms because we didn’t have zucchini or enough bell peppers. So good. How long would cook using bone-in chicken thighs? I would add 10 more minutes, but take the veggies out. Making this tonight. Why can’t the chicken and veggies touch? You basically want them in a single layer so it doesn’t steam. This sounds so good! My family loves red potatoes, so could I add that to the veggie mix? I know it will change the calorie count. Also, would bone-in chicken work and if so, would I have to cook it a bit longer? I LOVE your recipes! Do you think I could use bone-in thighs? I have a bunch in the freezer. This looks so good! I’ve never been let down by any of your recipes, but this was BY FAR the best. The marinade is to die for! I was a bit skeptical that such a small amount would cover everything, but it was perfect. I also added a very small butternut squash to the mix. Will make again and again! So many of your recipes are on regular rotation in our house, /9 needless to say, we are big fans. But I must say, this is my ALL TIME FAVORITE. I did sub cherry tomatoes for the carrots because I would eat roasted tomatoes every day of the week. So delicious, the chicken was tender and juicy, and everything was so full of flavor. I’m so glad I made extra for lunches this week! Thank you!!! I made this last night for dinner and it was surprisingly more flavorful than I thought it would be. Since the marinade only calls for 5 tablespoons of liquid I thought it was going to be dry but the roasting of this dish really brings out great flavors. I didn’t have any red wine vinegar so I just used red wine. And I roasted some small red skin potatoes to go with the dish while I was chopping the vegetables. It turned into a tasty, satisfying weeknight meal. Thank you GIna for always getting it right!! My chicken thighs were small and got a bit dry. I think everything but the carrots were done in 20 minutes. The flavors were really good and everyone enjoyed it. I would just make it without the carrots next time and take it out sooner. I’d also just make the vegetables as a side dish, they were that good. Hi there- I plan to try this out tonight with breasts as I also have a husband who won’t do thighs – Would it be better to brown the breasts on the stove top first as anemic looking breasts don’t go down well either, LOL! Thanks! I think that would be smart and cook it less time. This was really good!! Easy, tasty, smelled great cooking, very filling! My husband and I made this recipe last night. We LOVED it and will make it again soon! Does this meal work well with pasta and pasta sauce or should I stick with rice? Made this last night and it was delicious! Since it’s “Italian” marinade, does this dish work well over pasta and pasta sauce ? Or should I stick with rice ? It’s not saucy enough for pasta, I think rice is best. I made it with mashed potatoes, which is less points that either rice or pasta. This was fantastic! I doubled the recipe, so one sheetpan for chicken and one for veggies. Did a slight modification for my family’s taste (left out the thyme and oregano and was generous with the basil). Everyone loved it! And we’re looking forward to the leftovers! How can this be correct for the smart points? My tracker says that 8 oz of thigh meat is 13 points. 8 oz raw skinless, boneless, raw thigh is 4 smart points for 8 oz according to recipe builder. You have to use raw to calculate all the ingredients in the recipe. Oh my goodness…made this tonight and it was a HUGE hit!!! Great recipe, thanks so much! This looks great! I;m always trying to add more veggies to my meals. I make one really similar but with rosemary and fetta and then served with tzatziki – it’s yummo. Will give this version a try! Winner! Winner! My husband sees chicken and scowls. He raved about this dinner! Hooray! I added some red pepper for him. Love your recipes because we love veggies and you offer so many amazing ways to serve them. This was awesome. I swapped parsnips for carrots and yellow beet for yellow onion. This was so easy and flavor was great. Just wondering…you say not to let the chicken and the vegetables touch while they are cooking…can they be marinated together? Yes, that is so they roast and don’t steam. AHH! I had the same question. Thanks for clarifying. I had no idea that would make them steam. Love your recipes!!! Gina, congratulations on another winner of a cookbook. Got mine yesterday and can’t wait to cook my way through it. Best wishes on much success for it. The colorful picture clearly shows a layer of something that resembles lasagna pasta between the parchment paper and the vegetables. Nothing in the list suggests what it could be. What is it? Nope, no lasagna noodles. I think what you are seeing is just coloration on the parchment paper from the chicken and veggies. Hi Gina, this looks delicious, sheet pan recipes are the easiest and my favorite to make!! I also wanted to tell you I got my cookbook also yesterday and I am SO excited. I already read the whole preface and have started to mark my first dishes I’m going to make. Everything looks so easy and delicious. I can’t wait to start making these slow cooker recipes, thanks so much for continuing to come up with great easy recipes!! My picky eaters do not care for boneless chicken thighs. Could I substitute with either boneless chicken breasts or possibly bone-in thighs? PS: Thanks for all of the great recipes and tips. Serving size is 2 thighs? Is that correct? That seems like a huge serving. Yeah there is no way. I love the big serving size but something is off here with points. Did you plug this into your recipe builder? If you do I would love to hear what you get. I agree. Gina I LOVE your recipes and your new cookbook but my recipe builder is giving me 5 sp for 8oz then I have to add the olive oil. Help?!? I am using uncooked boneless skinless chicken thighs in the recipe builder. It says 32 oz is 19 smart points for the full recipe. Are you using cooked thighs? That would be more. My husband does not care for boneless chicken thighs. Could I use boneless chicken breast instead? PS: Thanks for all of the great recipes! It is a special treat logging on each day to find the new recipe of the day. I received your new book! I’m so excited to cook a few things from it this weekend! Got mine yesterday too- looks as awesome as the first- this recipe is the kind I love the most – unless i’m cooking in my Nesco – I am using the conventional oven in my Cuisinart Toaster oven. Since I am a single person – i rarely – if ever- use my oven anymore. This looks good although I’d have to substitute cider vinegar for the red wine vinegar. My cookbook cam yesterday also. So much good stuff in it, I can’t wait to sit down and properly “digest it.” Thank you for all the healthy recipes that my family also loves. I love sheet pan meals!!! Can’t wait to try this one. Just curious about the nutrition facts. Don’t understand how the sugar can be 4.5 grams per serving. Would you please explain this to me. Thanks for the recipe. Are you saying it seems low? How much more time in the oven would this need if I use chicken breasts? I love your recipes and your column! Thank you, it would be 20 min total for the breast. I just made this with chicken breast fillets and 20 min at 400 worked for me. I prepped this on Sunday and popped it into the oven after work on Monday! Delicious, healthy and easy! Got the cookbook today! So excited to cook your great recipes. The book is beautiful. Thank you for all your hard work. Makes it easy for the rest of us!! 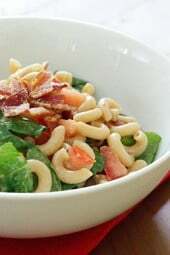 This looks yummy, need to try it soon. I just picked up my new cookbook today and started reading through I think I need to start at the beginning and make each recipe to the end they all look so good. I make the pancakes from your first book all the time. Grandkids love them. Love all your recipes. So glad to hear, thank you SO much! I received my the new cookbook today !! Very excited to try anything and everything!!!!!!! Looking for the smart points – are they posted yet and playing hide and seek with me?